Final preparations are being made in the workshop of the KAMAZ-Master team before the trucks are shipped to South America for the 2017 Dakar Rally. Scorched earth, dust, hot sun and bright blue Russian trucks: These images from this year’s Silk Way Rally are enough to make the heart of any racing fan beat faster. 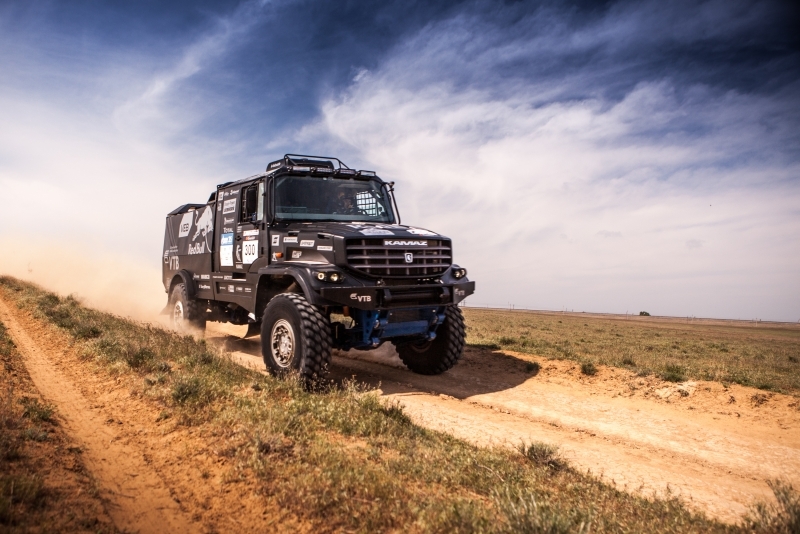 In January, it will all happen all over again: Russia’s KAMAZ-Master team, after solving its funding problems, will send four crews to the 2017 Dakar Rally. The traditional Dakar marathon rally will be held from Jan. 2-14 in Argentina, Bolivia and Paraguay. The "Blue Armada" will go to South America aiming to win: 13 titles in the Dakar Rally oblige the team to set itself the highest goals. The team is also anxious to take revenge for being deprived of victory in the last race. October is the hottest time in KAMAZ's auto center in Naberezhnye Chelny (660 miles east of Moscow). There is very little time left before the trucks are dispatched, so mechanics, engineers and racers work around the clock. KAMAZ-Master is the only team where racers operate wrenches along with mechanics. This experience is extremely valuable in "combat" conditions. In case of problems on the rally, pilots can replace any part, and sometimes assemble it from scrap materials. There is little time left for finishing touches: On Nov. 13, the vehicles leave the workshop in Naberezhnye Chelny and go to France. In the port of Le Havre, teams will undergo technical checks. The equipment will be sealed, so that no one is able to make changes, and loaded onto the ferry. It will take about 20 days for the trucks to reach South America. Having sent their vehicles on their way, the drivers do not go on vacation: They face intensive English classes, numerous marketing activities and long hours in the gym. Fitness training often decides the outcome of the race: It is the hardiest that win the high-altitude stages. "At the height of four and a half thousand meters, there is not enough oxygen, so even healthy people suffer from headaches in such circumstances," says 2015 Dakar champion Airat Mardeyev. "To drive at high speed, when your head is torn apart, is impossible." To adapt to the rarefied air they will face at high-altitudes in South America, while still in Naberezhnye Chelny crews train in special masks that reduce the oxygen content in the air they breathe in. Initially, racers even sleep in them. As in any sport, it is difficult to win the race if you have a weight problem. Mardeyev admits that he loves to eat and, at one point, even gained too much weight. But giving up dinner and enhanced training in the gym did the job. During the race, on the contrary, dinner is the only full meal. You cannot eat much before the race, so breakfast is very light. On the road, the drivers drink only water, which is supplied with a special tube connected to the thermos with ice. Because of the heat, they drink a lot to avoid dehydration. The team brings its own food: The drivers cannot do without traditional Russian soups, which the Dakar Rally's organizers do not make. In addition, KAMAZ-Master has a tradition – to cook pilaf on a day off. A cauldron and wood can always be found in one of the team's back rooms. There is another tradition, one which is followed by every team member. In the cabin of each vehicle is a collection of talismans that drivers, navigators and mechanics have received as gifts from their loved ones. As a rule, these are small soft toys. But "500," the number assigned to the vehicle driven by the Dakar Rally's current champion, has a bad name among the racers. They say that two zeros have never brought anybody luck: There are always some failures or accidents. These zeros hang over the racers like phantoms. This time, KAMAZ's main rival, Dutchman Gerard de Rooy, will be driving under this number. In the entire history of Dakar, only Vladimir Chagin has won the race while competing under the number 500. Chagin’s victory came in 2011, after which the seven-time Dakar champion announced the end to his sports career.